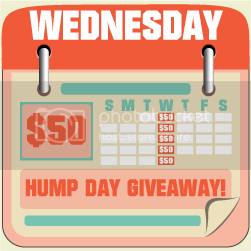 It's time for Hump Day $50 Giveaway and today's event is for Email Subscriptions. Thanks again to the 27 wonderful blogs listed below for making all this possible. When you're done, please do visit their blogs to find the latest news, tips, or deals and giveaways. For a short tutorial on how to subscribe AND confirm an email subscription click HERE but be sure to come back to enter through this blog via the form below. A note though: You can only join this on one blog/page. There will be a maximum of 32 entries ONLY. If you have more than 32, I reserve the right to delete duplicate or fraudulent entries. May I request that you use only one name and email address for quicker validation of entries. On the first mandatory entry, please do not forget to write The 24-Hour Mommy referred you since it is a mandatory entry. You must complete the first 2 tasks for 26 points before the others are enabled, and for all your other entries to count. Thank you very much and good luck. By joining this giveaway, you agree to the Terms and Conditions on the bottom of the form. Contest is open all-day Wednesday, from March 7th, 12:01am EST to March 7th,11:59pm EST (March 7th, 1:01pm Philippine time to March 8th, 12:59pm Philippine time).